XiVO comes with a WebRTC lines support, you can use in with XiVO UC Assistant and Desktop Assistant. Before starting, please check the WebRTC Environment. and create user with one line configured for WebRTC. 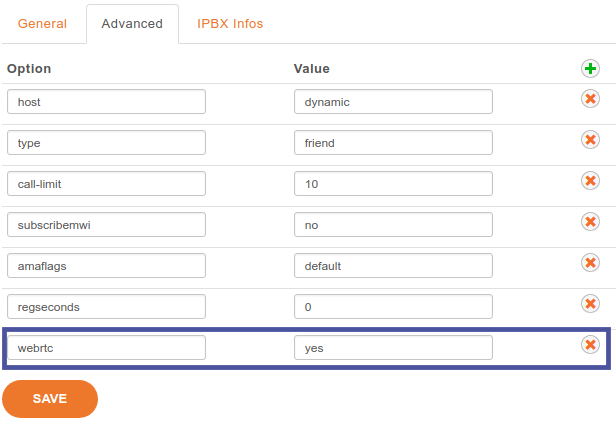 To have user with both SIP and WebRTC line is not supported. and by securing (e.g. via an external firewall) the access to the asterisk HTTP server (which listens on port 5039). When the user is not connected to its WebRTC line, or disconnect from the assistant, you can route the call to a default number as for example the user mobile number. Update the fail option on the No Answer user tab configuration, and add an extension to the appropriate context. Since 2018.02 as an experimental feature, susceptible to change or removal at any moment. Then you need to recreate the xucmgt container with xivocc-dcomp up -d xucmgt. WebRTC users are automatically configured with VP8 video codec to allow video calls, you must disable all other video codecs. Please avoid any specific codec configuration for WebRTC peers and be sure to remote all video codecs from the SIP General settings, tab Signalling, section Codecs. Either do not customize codecs, either do not select any video codecs.